Has reading ‘gone to the dogs?’ According to this Wisconsin educator, Diane Pollock, it has! No one pays attention quite like a dog. The novelty of reading to a dog is just the motivation some students needed. 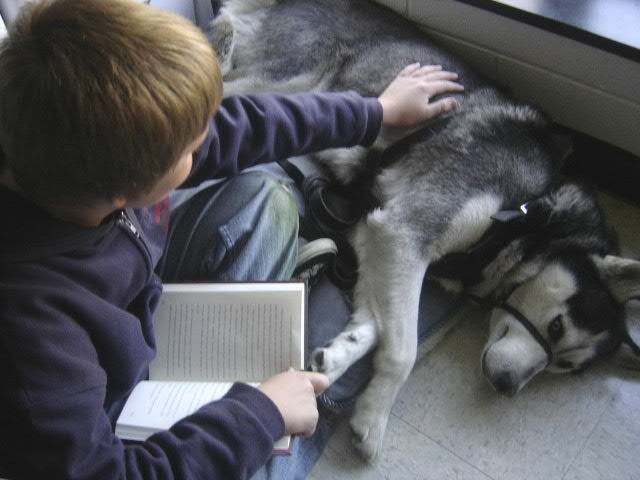 Beta, my 3 year-old Siberian Husky, listens to students read every week that he visits my classroom. Students earn paw prints for good behavior and having work done on time. These are placed in a bowl on a weekly basis and drawn by the previous person who just read with Beta. Three prints equal 5 minutes reading time. Other programs, like “The Reading Fur Fun’ and “Bideawee’s Reading to Dogs Program” explain that many kids who are reluctant to read, are less reluctant when reading to dogs. Dogs do not embarrass the reader by pointing out they’ve missed a word or that they are reading to slow. The reader feels better about what is being read. Researchers have found that when readers score below their peers academically, the reader may have a low self-esteem and don’t want to read in front of a group. Research shows that a reader finds comfort in reading to the dog because the dog seems to be paying attention. The reader begins to enjoy reading to the nonjudgmental canine friend. Teachers have discovered that not only are reading skills improved but there are other benefits not directly associated to books. Those include: decrease in school absenteeism, increased frequency in the completion of homework, improved social skills and self-confidence, and giving students who have issues in the home an environment in which they can have a companion to cuddle up with and even hug. Not everyone can bring a service dog or a trained dog to school. Some schools don’t allow dogs to visit classrooms. What is a teacher to do? Some teachers have purchased classroom pets, the stuffed ‘husky’ -toy dog. Students love reading to them, too! When students enjoy reading, they’ll read more. When they read more, they will learn more and expand their world. Reading is a key to academic success. It is a ‘dog- gone’ Idita-great idea!